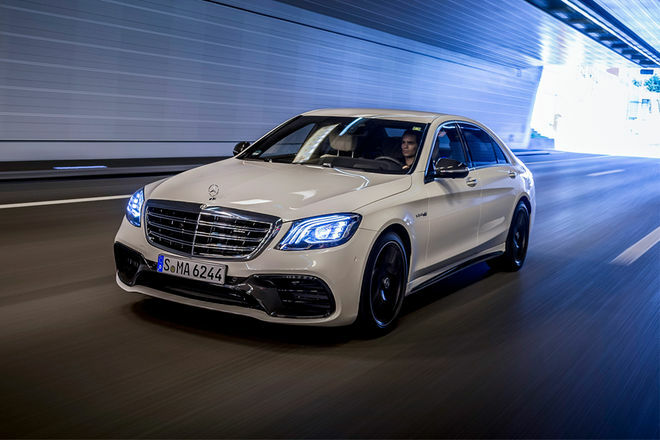 Mercedes-Benz last put the world’s luxury-car peddlers on notice with its new-for-2014-model-year, W222-generation S-Class. It featured automated parking, Magic Body Control air suspension with Road Surface Scan, six programmable seat massages, and automatic perfume dispensing. Mercedes-Benz set a standard in 2014 with its “Magic Body Control” system that used forward-looking cameras to instruct the dampers when to soften up for bumps, but Audi is trumping that feature with its AI active suspension, which will be able to use its cameras to measure bumps and dips and then direct electromechanical arms to push a tire down into a hole and pull it back out again (or vice versa for bumps). We understand Mercedes will introduce rival technology on its next GLS-Class SUV (using electro-hydraulic rams to manipulate the wheel corners under orders from the forward-looking cameras). You can count on that system appearing on the next S-Class. Mercedes enhances Active Brake Assist with cross-traffic alerts and adds Evasive Steering Assist. Think of that one like Brake Assist for steering, in that, when a collision is impending, if the driver initiates any sort of evasive maneuver, the car will make an expert driver of him or her by steering itself clear of danger and then countersteering itself back into the lane or out of danger of spinning. The active blind spot and lane keeping assist functions also both operate at a wider range of speeds now. This is a mighty subjective category, and these two players repeatedly set benchmarks in interior comfort and design. For 2018, Mercedes integrates both of the large 12.3-inch high-def instrument panel an infotainment screens under a single plane of glass and fits an all new steering wheel that features small touch-sensitive pads that you brush your thumb or finger across to scan or scroll and press to select. Both are pretty sublime, truth be told, but maybe that’s just because each will tirelessly massage the driver’s back for the duration of any trip. The base V-6 and V-8 variants each excel at being driven in a serene and stately manner befitting their class. Auto stop/start shutdowns were a bit more noticeable in the S450 than they were in the S560 or A8s. So is it worth waiting another year for the A8 (or three for the completely new S-Class)? Tech geeks who’ve been waiting for a truly predictive active suspension since before that old Infiniti Q45a will definitely want to sit on their wallets. Those who want their lux-sedan to breath fire, step right up to the AMG counter now (unless you insist on the S65, which hits the market in late 2017). Everyone else, study the galleries of Mercedes and Audi photos (both are featured in the gallery below), and pick the one that makes your knees go wobbliest. You can’t really go wrong either way.